If you’re making the trek to Las Vegas for the 2019 International Builders’ Show or are still on the fence about it, consider this: An exclusive chance to see a house, delivered by a standard pickup truck, that literally unfolds within a few hours into a 1,600-square-foot dried-in structure. Or how about an L-shaped, mid-century modern home, complete with a sloped single-form shed roof, that belies its core of six factory-built modules? 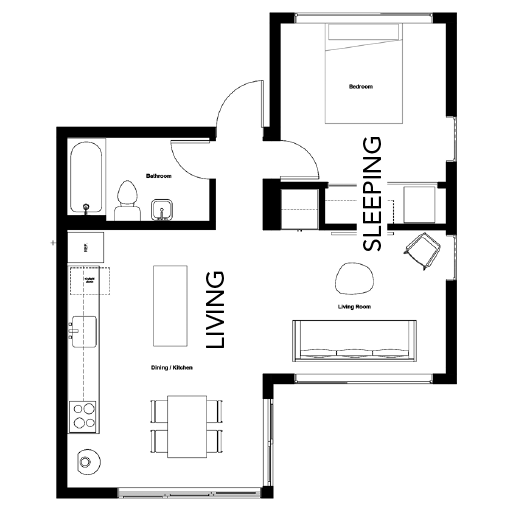 Or maybe a pint-size but fully appointed granny flat (aka accessory dwelling unit or ADU) that sets a new bar for flexibility and affordability? And let’s not forget an 8,200-square-foot, single-level luxury home with trendsetting design moves, high-performance chops, and a panoramic view of the Las Vegas Valley. If you go to the Show, take a break from the exhibits and seminars to get some fresh air (and some fresh perspective) with a few cool industry innovations just outside the door. We weren’t kidding about the folding house. Or the mid-century modern modular home. Even the granny flat has a compelling and relevant story for the industry. They’re all in the 2019 edition of the Professional Builder Show Village, a stone’s throw from the Las Vegas Convention Center’s main entrance. Imagine you’re a general-contractor-turned-developer in Las Vegas looking to build a new home for your growing, multigenerational family. You like the mid-century look of long, staggered forms under a low-slope, single-form roof; an increasingly popular style among builders in Sin City. The only question is, who do you choose to build it? For GC-turned-developer Joe Crosland, the choice was … modular—in fact, a set of six modules from Mods PDX, a factory in Portland, Ore., nearly 1,000 miles away—to achieve his 3,640-square-foot dream home. “This is all about lifestyle, not modular housing,” he says. “It first has to come across as a well-designed mid-century home,” both inside and out, reflecting efficient use of space, an open-air feel, and a fluid indoor-outdoor connection. That challenge intrigued Kegan Flanderka and Drew Shreiner, partners and principals at Base Design + Architecture, also of Portland. “Modular does have some limitations, but we found ways to bend them a little to give Joe and his family what they envisioned,” Flanderka says. Show Village 2019 is open for free, self-guided tours during the International Builders’ Show, Feb. 19-21. No tickets are required, but you must be registered for IBS. The primary example: combining two modules to form the main public areas of the home—together a 1,400-plus square-foot space housing the kitchen, family room, and a dining area. The space also features a massive pantry with convenient (and logical) access from both the kitchen and garage. “It gets all that stuff and storage out of the living spaces,” says Crosland, helping achieve the clean, uncluttered look he wanted. 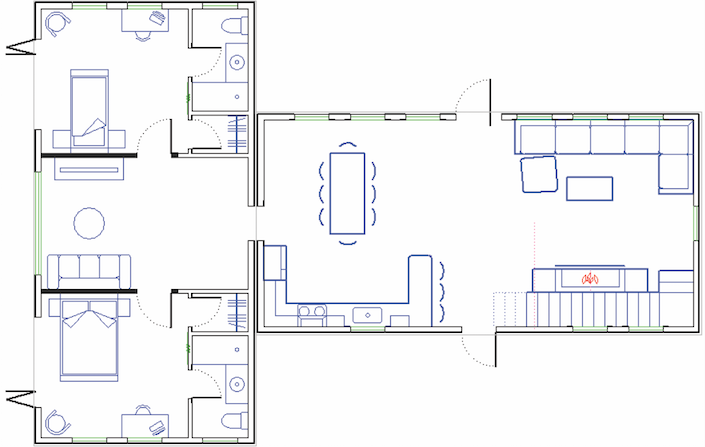 Flanderka and Shreiner also eschewed the long-held (and limiting) idea that all modules are created equal; each of the six units that make up Crosland’s home are of slightly different dimensions to accommodate desired spaces and uses, instead of the other way around. Las Vegas-based Boxabl is among a growing list of companies looking to change the world of housing production in the U.S.; an ambitious view of the future, for sure, but also one that provokes thought and deserves consideration. The 1,600-square-foot prototype that Boxabl will unveil at Show Village 2019 is likely something you’ve never seen before: a completely finished and dried-in shell, including exterior cladding, that unfolds from a tight 8 ½-foot-wide by 12 ½-foot-tall by 40-foot-long package delivered on a flatbed trailer pulled by a pickup truck. In fact, Boxabl will unfold two roughly 20-by-40-foot “rooms” (its nomenclature for module) at Show Village: a public wing and a private wing of equal size but built out with different room arrangement—one for kitchen and dining and living spaces, the other for two bedrooms and a TV area. The two rooms will be set perpendicular to each other, connected and finished to create what appears to be (and is) a very traditional, one-story family home. A flat ceiling folds down to enclose each room, ready for plated roof trusses and a roofing finish to be applied in the field. The concept seeks to overcome the limitations of shipping traditional modular housing units farther than a few hundred miles across state lines, without suffering damage en route—factors that hinder the segment’s ability to scale beyond a 3 percent market share, says Galiano Tiramani, the company’s business development manager. The Boxabl system also employs structural insulated panels (SIPs) in standard, repeatable dimensions, using magnesium oxide (MgO) board instead of OSB to sandwich the insulation layer. The result: a structural panel that’s nailable, waterproof, fire resistant, won’t grow mold, and can be left as the exterior finish or serve as a substrate. “We have an all-in-one-system that combines several trades to reduce cycle time and manual processes,” says Tiramani, “and even more so with MgO.” Rooms also are pre-wired and ready for fixtures and trim, while recessed channels in the ceiling panel are set to carry other mechanical runs. The standardized dimensions of the rooms and the ability to frame the interior walls in any configuration of room sizes also enables Boxabl to stack them for multistory structures—an intriguing prospect for both for-sale and rental housing, as well as for student and military-base housing, among other uses. Definitely a showstopper, maybe even a game changer. They go by many names—granny flat, she shed, tiny house, and the sterile-sounding “accessory dwelling unit” (or ADU)—but one thing is for sure: They’re coming to your town, if they haven’t already. At Show Village 2019, a next-generation take on the concept, called Stuga (Swedish for small house or cottage), is on display from Mods PDX, in Portland, Ore., the same outfit that’s building the Crosland Residence. The series is designed by Studio Petretti Architecture, also of Portland. 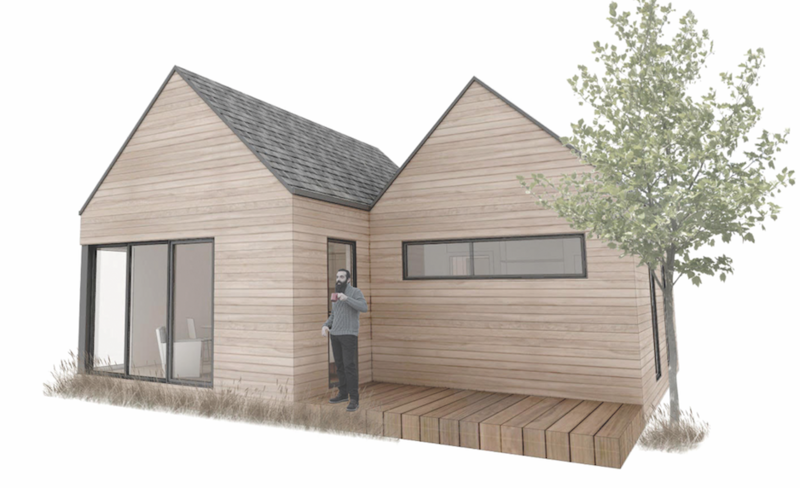 The Shift version is a one-bedroom, one-bath ADU that features two roughly 300-square-foot modules staggered (or “shifted”) to create some dimension along its elevations and opportunities for modest outdoor living spaces. In addition to the Shift, there’s the Stretch (in which two modules are placed end-to-end), the Box (flush side-by-side), the Pivot (perpendicular), and a single-module studio. Each configuration offers a trio of color options and multiple siding and roofing finishes, a formula designed to not only accommodate increasing demand for these types of houses and to afford a measure of individual styling, but also—and perhaps most significantly—to reduce their cost. “Clients wanted to streamline the design/build process, so we came up with Stuga,” says architect Katie David. In addition to the production efficiencies of building repeatable modules in a factory setting, the firm also manages permitting at the state level and will work with municipalities and utilities on the on-site details. “It suits just about any situation where a small living space is needed,” says David, who also sees the concept catching on for weekend or vacation getaways on an owner’s rural lot, where costs for one-off construction are often higher. To further ensure that built costs would be kept in check, her firm collaborated with Mods PDX to build Stuga under controlled factory conditions. “We wanted to crack the nut on offering something affordable and at scale with some key options,” says Mods PDX CEO Nathan Young. Those slight variations also allow Young’s production to operate at predictable costs and schedule, regardless of scale. “We’re working to simplify the built process as much as possible,” he says. And while granny flats and she sheds may not be the end-all answer to housing’s supply and affordability issues, that commandment may just hold the key. Show Village is produced by Professional Builder magazine / SGC | Horizon. It would not be possible without the generous contributions of valued sponsors. If you find yourself with a little extra time at IBS and want the absolute best view of the Las Vegas Valley, with the Strip smack-dab in the center, get your free ticket to tour the 2019 version of The New American Home (TNAH). Built in Ascaya, a truly unique community in nearby Henderson, TNAH 2019 showcases its unabated, panoramic view of the valley through a pair of 20-foot-wide telescoping patio doors that pocket into the walls to create wide-open avenues to a modest yet well-appointed outdoor living space, one of many “wow” factors within its footprint. The 8,200-square-foot, single-level desert contemporary with a mid-century vibe was designed, built, and outfitted by Sun West Custom Homes, a Las Vegas-based team led by owner, residential designer, and local trendsetter Dan Coletti. Approaching each lot as a unique and new challenge, Coletti allows the land to help inform his designs. “Each property kind of speaks to you,” he says, from the path and intensity of the sun across the lot, to views and the surrounding landscape, among other elements. “I don’t have a library of plans and I don’t consciously borrow from past projects when I’m designing a home,” he adds. TNAH 2019 is no different. The shape of the roof shading the outdoor living space, for example, follows the curve of the rear property line, while a series of square forms used for several spaces are angled 90 degrees to draw interest, create more usable space, and capture views. 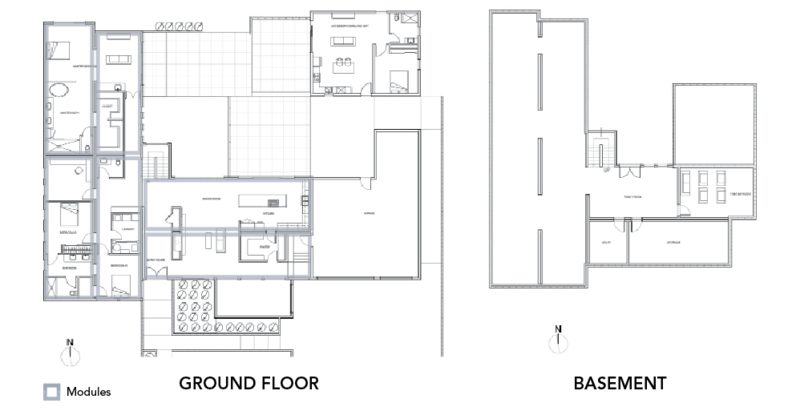 Then there’s the intriguing entry courtyard; a wide, covered walk that showcases and provides access to a study on one side and a “show garage” on the other, the latter augmented by a lounge-like setup with direct access into the house. The New American Home 2019 is open for free, guided tours during the exhibit hours of the International Builders’ Show, Feb. 19–21. Tickets are required and can be obtained at no cost at The New American Home/Remodeled American Home booth near IBS registration at the Las Vegas Convention Center. For more information about the project, sponsors, and key products, visit The New American Home 2019 website at tnah.com. The New American Home program is a partnership between NAHB’s Leading Suppliers Council (LSC) and Professional Builder magazine / SGC | Horizon. It wouldn’t be possible without the generous contributions of valued sponsors.